Here is a highly photographed, multi-talented, enigmatic character from the Clan Tynker Family Circus troupe. Her stage name is Serendipity. She is 47/100 of my strangers. Make no mistaking it: what you see on her face and body is meticulously applied makeup, not a mask. Serendipity made strong eye contact with me during her troupe’s first act. Or at least she had the ability to make me feel that way. During the break between two performances, I approached her to ask a question about the origins of her beautiful costume. Her sister Rebekah, another of the performers, shared with me that her sister was born mute, and does not speak. That was when it clicked as to why she paints her face in white: she is a mummer (or mime), who performs theatrical movements and gestures to entertain and captivate without use of words. Serendipty played many instruments, including the accordion seen here. 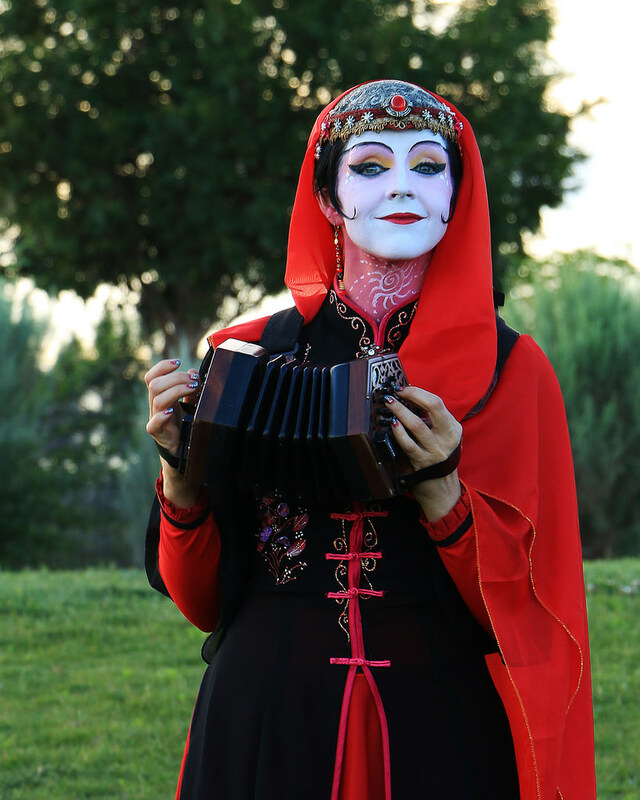 On her own, she danced with ribbons, performed mask dances, did tricks with a diabolo, and in general served as a silent Greek chorus in the background of her siblings’ acts of balance and juggling. To communicate with me, Serendipty used hand gestures and facial expressions. I asked her if it was OK to photograph her, and she nodded to accept the attention. I have a series of photographs of her blowing bubbles for children in the performance break. She filled the children with wonder with an illusion that plays on object permanence. She is able to convince the children that she has transformed a bubble into an opalescent bead for them to keep. The best sort of magic! What a fasinating story. I love your posts on strangers. I think all of us are missing a lot in life by not talking to strangers. There are so many wonderful stories out there to tell. Thanks for sharing Serendipity’s story with all of us.